Perfect if you want privacy! This house is not overlooked by any other villa. It sleeps up to 8 persons in 4 double/twin bedrooms and has a private swimming pool. For people in wheelchairs or with limited mobility, the downstairs double bedroom is ideal, being next to the downstairs shower room and W/C with commode available. British plumbing and WC - no small pipes! IMPORTANT NOTE TO PARENTS WITH SMALL CHILDREN! This villa has a downstairs kitchen which looks out directly onto the gated pool. This means you can see your children playing in the pool while you are preparing lunch! Many other villas in the area have not been designed with holidaymakers like you in mind because they have an upstairs (Greek Style) kitchen which means you may have to balance a meal and a drink on a tray while walking down a flight of stairs with a toddler following behind you or under your feet! We designed this feature BEFORE the houses were built - you are not an afterthought! Our guests often comment that this villa is in the perfect location: within walking distance from two villages, close enough to enjoy their facilities but not too close to be disturbed by barking dogs, crowing cockerels and noisy human nightlife that happens in any and every Cretan village or town. 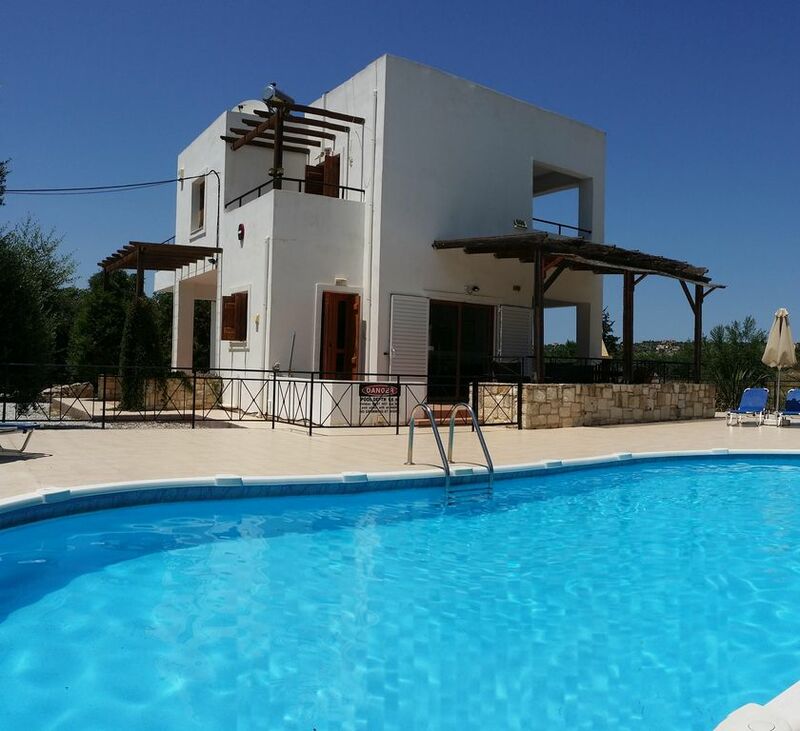 The villa is located in a peaceful private olive grove of 4.5 acres (17,000 square metres). It is one of only 5 villas in the olive grove, all of which are owned by us. The olive grove is secure, being fenced and hedged by colourful oleander, and surrounded by olive trees. It is the perfect base to explore the picturesque Apokoronas area on foot or by car, with its tiny white hamlets nestled on green mountainsides. Apokoronas is a designated area of natural beauty, protected in a similar way to a National Park. At all times there are breath-taking views of the White Mountains which are snowcapped until late May. Literally on your doorstep there are numerous foot-trails through this most spectacular area of Crete, a genuine walker’s paradise. Close to the villa are two villages. Almyrida, by the beach, is only a 3 minute drive away or you can walk it in half an hour. Gavalochori, further inland, is only a 1 minute drive away and you can walk there in less than 15 minutes. Bathroom 1 - Toilet, Bath with Shower. Bathroom 2 - Toilet, Shower Enclosure. Lounge / diner, leather sofas. TV / DVD and satellite TV for English language films, Sky News, BBC News, Music Video channels etc. Note: INTERNET ACCESS available in nearby village. Wheelchair users: one double bedroom downstairs, next to downstairs w/c shower-room - shower-seat & commode available. Roll-up ramp available. Lovely villa with pool, spotlessly clean, nestling in the foothills of Crete. Idyllic. We have just returned from a fantastic family holiday 8 of us stayed at the villa. No problems. You do need a car. Lovely local restaurants quiet and peaceful. Jeep safari and baoa trips were great local watersports good. Beach front resturants nice but pricey. Large Supermarket 15 mins in car. Thanks for your review. It was quite hot when you arrived so we are not surpised you too the sensible option of the taxi! Regarding the cleanliness, you will recall that Marcus (one of the owners) met you on the day of your arrival and you discussed your concerns and these were addressed within 24 hours. There was indeed an oversight on the cleaning on that occasion but our manager came to make good very shortly after you reported it, and I believe all was well for the remainder of your stay. As you will be aware there had been some building work going on in the olive grove opposite your villa and this plus the extra traffic kicking up dust from the unsurfaced access road at the side has contributed to an environment that is dustier than normal (the other villas, being further away, don't seen to have this issue). As to the furnishings, I believe you are referring to some sun loungers and sun umbrellas around the pool. We sent some away for recovering at the time of your visit and I can confirm that these are now ready to be installed once we collect from the pool shop in Kalyves. We are glad you have an overall enjoyable experience and you'd be welcome to return and hopefully enjoy the fresh new furnishings! This is our second visit to Villa Asteria which has all the amenities we require for that perfect holiday. The owners give excellent information on the villa and surrounding area, the views are out of this world, mountains one way, olive trees the other, the sound of mountain goat bells in the distance. We have enjoyed this villa so much I have just booked for another two weeks in August of this year after our three weeks in May!. We are delighted to be welcoming these guests back later this summer. The views really are wonderful and ability to relax and enjoy the views is a very important part of the holiday experience. This was our fourth stay at Villa Asteria. We usually stay in May/June but this year took a later break. The weather was lovely. Booking with John has always been quick, efficient and friendly. Mark and his team look after the villa well and answer any queries quickly. There have been improvements to the villa over the years and anything we have mentioned has been put right by the following year. We feel totally relaxed the moment we arrive - lazing round the pool, lunches by the sea in Almyrida and eating in the evenings in Gavalachori. This year we took a trip to the Botanical Gardens of Crete,up in the hills south of Chania which were interesting but possibly not on very hot days! The description of the villa is accurate but words cannot express the feeling of calm and peacefulness that one gets from the surrounding hills and the views of the mountains - and the wonderful sound of the cicadas in the evenings. The information book needs to be updated and I am sure this will be done. This is the reason for 4 stars. We love the area and would not think of taking any other villa. The peace and quiet is a key part of the experience of staying at the villa and our location surrounded by mountains does allow guests to relax. When you are ready for a lunch or evening dinner there are some wonderful tavernas nearby. We enjoyed our stay at the villa. It was private and very restful - rarely heard distant voices from the other villas and pool felt very private even allowing for occasional passing traffic. Also spacious, which was important to us as a couple with three teenagers in the party. This allowed us to stay downstairs and get up earlier and leave them undisturbed! Good facilities in the kitchen and comfortable seating area - nice to have proper sofas rather than sofa beds which are often impossible to relax on. Good location for visiting other parts of this area of Crete - lots of interesting places within 30 minutes drive. The restaurants in Gavalochori were great. People were all very welcoming. Our favourite was the Grill House, with Astimari a close second. We did find the walk longer than described, but that reflects our poor level of fitness as desk-bound people 48 weeks a year - the teenagers nipped up and down happily. Fantastic views of the mountains, especially in the mornings. For a 15 year old boy to mention that as one of the highlights, the view must be spectacular! Would recommend this villa to families who are looking for a comfortable home, in a quiet location with good access to beaches and places of interest when you do want to go out. Almyrida Village just 2 km away (3 minutes by car, or half an hour walk) with safe, sandy beaches and great places to eat. Here is a quiet seaside resort far from the bustle of the major tourist destinations. It is the ideal choice for families with children because there is an organised beach plus shops, restaurants and an ATM. There are two sandy beaches with umbrellas & loungers for hire, plus a lifeguard. The beaches and the sea are awarded a Blue Flag every year, demonstrating they are clean and that the beach provides the necessary safety features and visitor facilities – such as free showers at various points on the seafront. The sea is quite shallow, making it ideal for small children. The eastern end of the beach has sheltered, warm waters perfect for inquisitive youngsters who like to play near the shore chasing small shoals of fish and tiny hermit crabs, or amuse themselves by building sandcastles. Very close by, and directly overlooking the beach, is a variety of family-owned tavernas where dads and mums can de-stress in the shade with a cool glass of wine while keeping an eye on the kids playing nearby. Also on the beach, there is a windsurfing school with canoes and pedalos for hire and numerous boat trips available around the coast. For the slightly more adventurous, there is a diving school where beginners can try scuba diving – and for those with PADI qualifications, a visit to the famous underwater elephant cave is to be recommended. This coastline of Crete has the best and most impressive diving in the whole of Greece. Gavalochory – the picturesque village with 1000 years of history. Inland, just a kilometre from the villa, is the traditional village of Gavalochory. This is a large village with particularly interesting and well-preserved folk architecture. There is an excellent folklore museum, revealing the history and the culture of the village. And don’t miss the Roman Wells just outside the village, a remarkable place of sunken wells where locals scollected water in ancient times. Shops include several minimarkets and a bakery. There are four tavernas – all of which offer excellent traditional Cretan cuisine. Chania Town – 22 km away. Chania (pronounced Ha-nya) is famous for its beautiful Venetian (Italian architecture) harbour, with narrow winding cobbled streets that is every shopper's paradise, with a multitude of boutiques and jewellery vendors plus several markets. Sit at one of the many fine quayside tavernas and watch the world go by before taking a boat trip where you can go snorkelling around sheltered sandy bays of uninhabited islands. There is also the submerged wreck of a WW2 German Bomber to explore. A good place to spend a morning is in the Maritime Museum of Crete – a multi-floor local museum full of models, graphics, memorabilia, costumes and military artefacts plus some educational video. It covers the time from ancient Minoan era to near present day and includes the famous Battle of Crete. A ‘must-see’ for anyone interested in WW2 history. •	Water Park at Limnoupolis (40 minute drive). Lots of slides providing varying levels of thrills and fun. Free sunbeds, good pools and an artificial ‘river’ where you can lie in a big rubber ring and gently float around the park. •	The Botannical Gardens of Crete (18 km south of Chania, 40 minute drive). A huge, colourful park full of fruit trees, herbs, medicinal and ornamental plants from all over the world - the perfect microclimate for hundreds of plants and animals. In the midst of this vivid landscape stands a burnt centennial olive tree, a memorial and a reference to the terrible fires of 2003, the park’s history and origin. The dramatic scenery here is composed of rare samples of the local flora and fauna, as well as tropical and subtropical species with new samples added regularly. There is a lake with ducks, geese and other water birds and rare species, even hawks that fly in the area. The park also has an open-air, stone atmospheric amphitheatre suitable for small (capacity for approximately 250 persons) events. •	The Samaria Gorge (1 hour drive) – at 16 km, one of the longest gorges in Europe. Open most days in the holiday season, but be prepared for a challenge. •	The Imbros Gorge (30 minute drive) – a little easier than Samaria, but still a good 8 km hike through sheer sided cliffs. Very pretty, so bring your camera. And plenty of bottled water.